I want to log when the user opens and kills the app, and when it is put to the background. So far I have been trying with onStart/onStop/onPause/onResume/onDestroy etc, but this is only about the activity that I put this on, not the entire app. 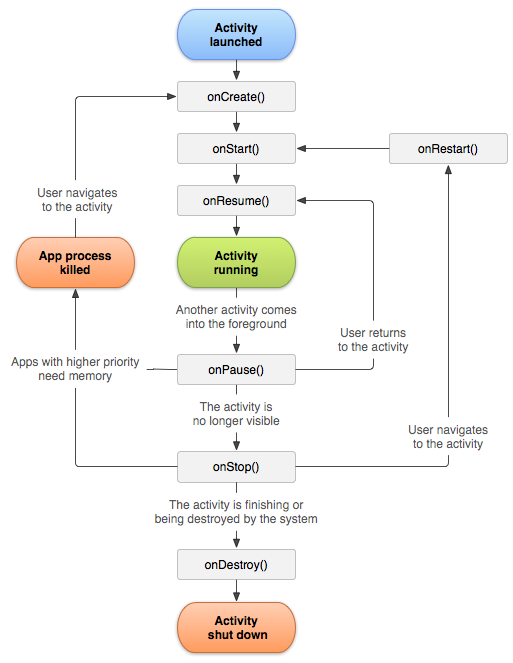 So when the user goes from the MainActivity to some other Activity inside the app, I don't need to know, but when he then goes out of the app, or even kills it, I would like to log that. I think what you are looking for, would be solved creating an AbstractActivity. Implementing the log logic onCreate()when starts and onDestroy() when go out of the application. Then all your activities could extends AbstractActivity so it would do the log stuff. Not the answer you're looking for? Browse other questions tagged android android-lifecycle or ask your own question.